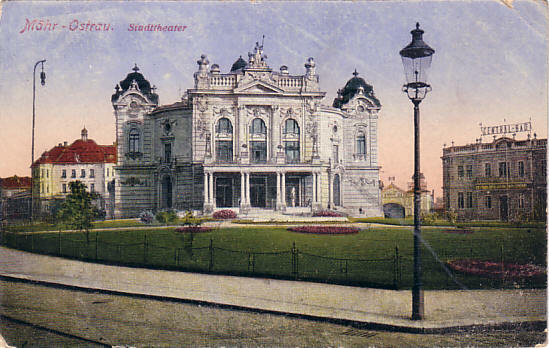 Built 1905-1907 by Alexander Graf as "Stadttheater" for the city of Mährisch-Ostrau. 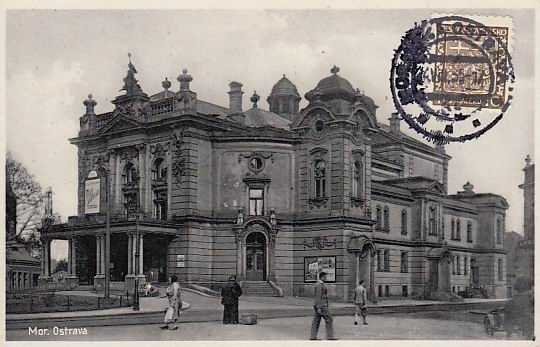 Opened 28 September 1907 with Schubert's ouverture to "Rosamunde" and Schiller's "Wilhelm Tell". Until 1919, used by a German theatre company. 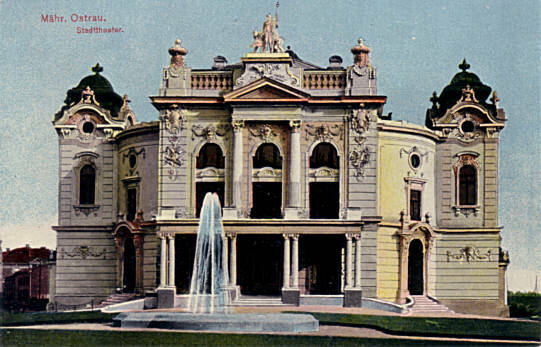 Since 1919, used by the Czech company "Národní Divadlo Moravskoslezské" (National Moravian-Silesian Theatre). 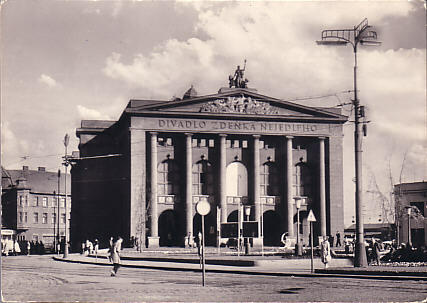 1945 renamed "Zemské divadlo" (Provincial Theatre). 1949 renamed "Divadlo Zdenka Nejedlého" in honour of the Czech musicologist, journalist, and politician, Zdenek Nejedlý (1878-1962). 1954-1956 rebuilding with façade alteration. 1969-1971 extension by Ivo Klimes. 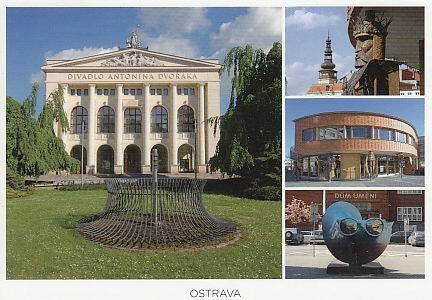 1990 renamed "Divadlo Antonína Dvoráka" in honour of the Czech composer, Antonín Dvorák (1841-1904). 1999-2000 renovations. Re-opened 31 Dec 2000. Originally 854 seats, today 531 seats. 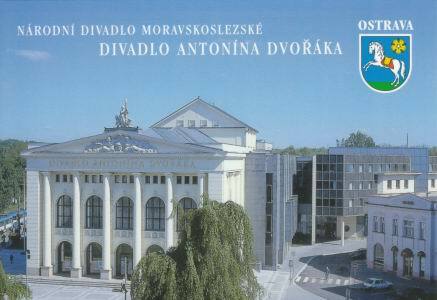 Used for opera, ballet and drama performances by the resident "Národní Divadlo Moravskoslezské" companies. Front Text: "Mähr. 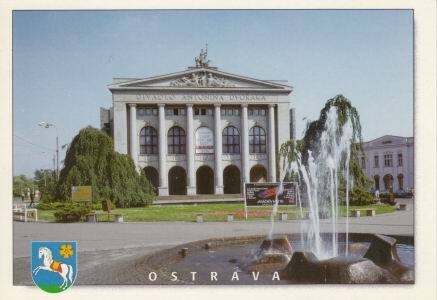 Ostrau - Stadttheater"
Front Text: "Mähr.-Ostrau - Stadttheater"
Reverse Text: "Mestské divadlo. 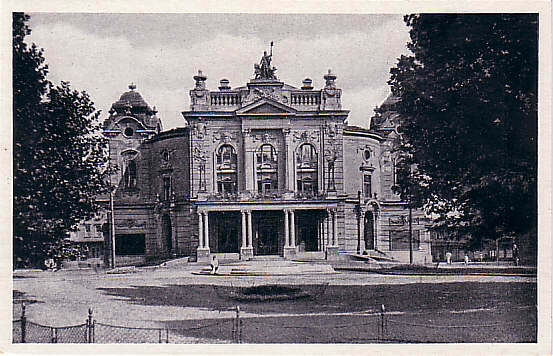 Stadttheater." Reverse Text: "Mähr. Ostrau - Stadttheater, Mor. Ostrava - Mestské divadlo"
Front Text: inscription: "Divadlo Zdenka Nejedlého"
Reverse Text: "Ostrava - Divadlo Zdenka Nejedlého"
Front Text: "Ostrava"; inscription: "Divadlo Antonína Dvoráka"
Front Text: "Národní divadlo moravskoslezské Divadlo Antonína Dvoráka", "Ostrava"
Reverse Text: "Národní divadlo moravskoslezské Divadlo Antonína Dvoráka; Rekonstrukce a Pristavba / Cerven 1999 - Listopad 2000"
Reverse Text: "Ostrava!!! Divadlo Antonína Dvoráka / detail Divadla loutek / Divadlo loutek / plastika Úsvit pred Domem umeni"